Citing archival material in an academic paper for school or for publication can be a challenge. A complete set of references must contain all the details about each source used in your research so that each one can be relocated and examined in its descriptive context. That’s not always as straightforward as it sounds, especially with respect to archival material. The style guide that your professor, editor, or publisher recommends is a good starting place. A number of style guides offer useful information on how to cite archival or manuscript material. Most of the questions we receive about citation styles relate to those followed by the American Psychological Association or APA and the Chicago Manual of Style. If those guides aren’t helpful, seek advice from a reference librarian at a university library or browse its website for a condensed style guide, available on most university library sites. Local public libraries may also have hard copies or online versions of various style guides, so it’s worth checking their catalogues or speaking to their reference team. If you still have questions about citing materials from Library and Archives Canada’s collection, consult the web page How to Cite Archival Sources, which has examples of footnotes and citations for several different types of archival material. Always keep in mind, too, that the main point of a citation is to leave a trail that will lead future researchers back to the source you used in your research. And if you’re unsure about what information to include in your citation, remember that more is better than too little. It’s much easier to sift through too much information than it is to fill in the blanks! This is a great starting point if you have those details already. But what if you don’t? There are a few different ways to find what you need. Local newspapers can also be a great resource to find at least some of the details. You could start your newspaper research here at Library and Archives Canada (LAC) by checking out our microform holdings. If you aren’t able to visit us in Ottawa, you could contact your local library instead to see if they’re able to borrow the reels you need from us or another library. .And, as always, if you’re stumped and need help, don’t hesitate to ask us a question! Megan Butcher is a Reference Librarian in Reference Services Division at Library and Archives Canada. Government of Canada press releases, also referred to as news releases, are issued for the media to announce the latest news of government departments. At Library and Archives Canada (LAC), we hold a number of press releases, some in hard copy format in our archival holdings, and some in our published collection. The LAC collection is a great starting point to search for older releases that are not currently online. However, it should be noted that the collection is not comprehensive because press releases were not collected systematically throughout the years. This blog post will focus only on the available materials we have in our published collection, most of which span the years 1945 to 2004. It will also discuss how to find more recent press releases on individual government department websites and through the Government of Canada Web Archive (GC WA). News releases in our published collection can be retrieved through the AMICUS library catalogue. It is helpful to know the department and time period you are seeking, as the releases have been catalogued chronologically for each government department. Here is an example of a series of press releases in our collection from the former Department of Communications. For more search tips, please contact us with your question or visit us in person. There are also search tips available in AMICUS. To find more recent news releases, such as those dating back to the late 1990s, try searching the GC WA. The GC WA is available through our website and provides access to harvested material from former Government of Canada websites. The archive can be searched by keyword, department name, or URL. It is most effective to search by department name (available through the red menu on the left), then scroll through the list of departments and click on specific ones of interest. This will take you to different snapshots of the websites where you can navigate to the news section to view the releases. Please note that this is an archived website, so certain links may not be functional, and older content on the website is no longer being updated. 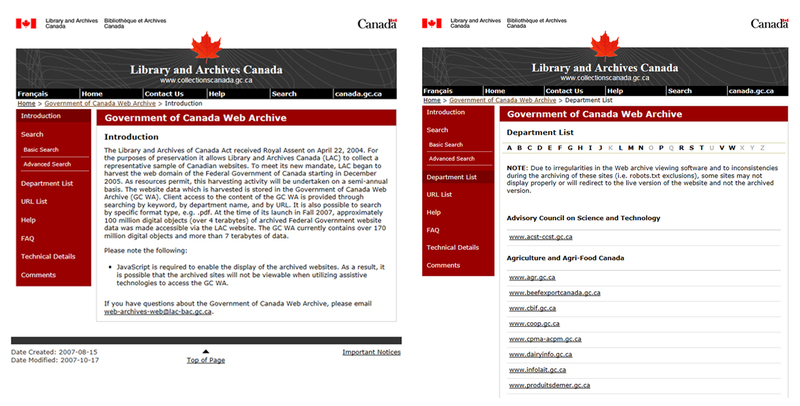 A screen capture of the introductory page for the Government of Canada Web Archive (left) and the page listing the departments (right). In regard to the most recent news updates, the releases for the last several years (depending on the department) are mainly available through individual websites for government departments, crown corporations, and the Prime Minister’s Office. For example, Innovation, Science and Economic Development Canada (formerly Industry Canada) has news releases on its website archived back to 2012. There is a Government of Canada News Releases website as well, which is a list of the most recent news releases compiled from all federal departments. Please contact us for any other questions you may have on Government of Canada press releases! Emily Dingwall is a Reference Librarian in the Reference Services Division at Library and Archives Canada. Are we missing part of the historical record regarding Oronhyatekha? Searching through archival records can sometimes lead to unexpected discoveries. In my work as a reference archivist at Library and Archives Canada, I regularly conduct research for researchers’ requests. While investigating if a certain individual had actually received formal military training in 1865 at the Toronto School of Military Instruction, I consulted Library and Archives Canada’s online database, Archives Search. A keyword search located the first Register of Candidates Admitted to the School of Military Instruction, Upper Canada (Toronto), 1865-1867, in the record group relating to the Department of Militia and Defense (RG9), Volume 7. When I consulted the school ledger, the name I was looking for was not there, but another name instantly caught my attention. Standing out clearly on the list, amid the old script of European first-middle-last name format, was the single Mohawk name Oronhyatekha. The ledger contains many columns of information. In particular, on page 9, it indicates that Oronhyatekha was 23 years old, from Shannonvillle, but living in Toronto. In subsequent lists, he is indicated as being admitted to the school at Toronto on May 6, 1865. On July 29, 1865, he is noted as the “candidate permitted to remain in school for purpose of qualifying for 1st class certificate”—an honour accorded to few students. Information can also be found on Oronhyatekha, also known as Peter Martin, born in 1841, in the Dictionary of Canadian Biography, where select biographical entries on significant Canadians can be found. Upon reading this entry, you will note that there is no specific mention of Oronhyatekha attending the School of Military Instruction. Therefore, it appears that there are gaps in the historical record, and we are wondering if this is something new to add to his biography. Please contact us if you have any additional information on this important individual. Richie Allen is a reference archivist in the Reference Services section at Library and Archives Canada. Let’s be honest: Finding information on a civil aviation accident is no small feat. In the federal government, organizational changes involving aviation accident management and the evolution of records classification are making the researcher’s task even harder. But seek and, generally, ye shall find! 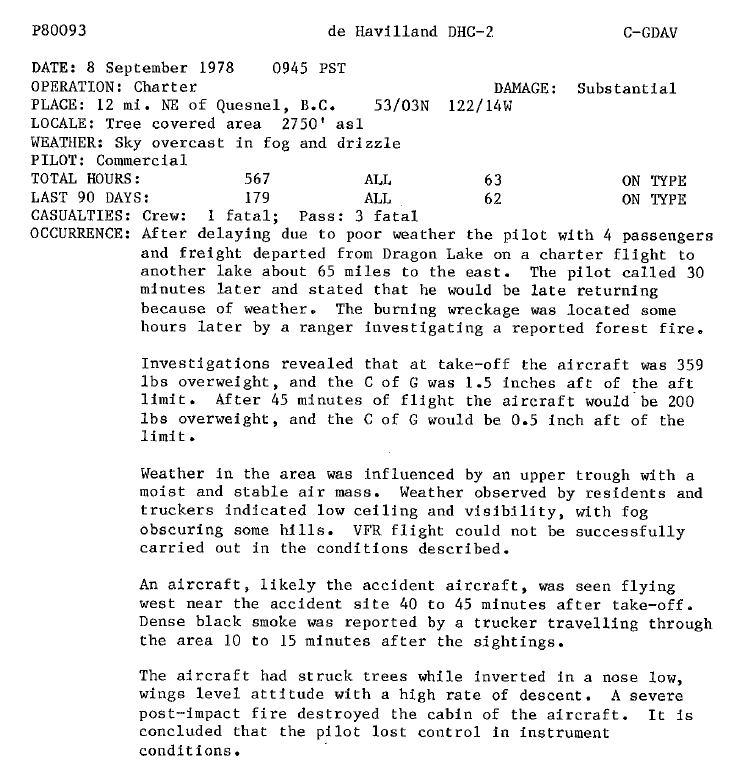 So let’s look at how to go about researching an aviation accident effectively. This will make things easier, because the finding aids related to aviation accidents are put together based on that basic information. Each record group is divided into series and sub-series. For each of those subdivisions, you will need to consult a finding aid to determine whether a file exists pertaining to your research topic. It is a painstaking process, but some aids are available online (for example, the accession “Aviation Accident Reports 1919-1977“—RG12), which narrows down the research that needs to be done at 395 Wellington Street, Ottawa. Two types of records pertain to accidents: the accident report and the occurrence investigation. They are not always filed in the same location, so you’ll have to check the entire record group to find them. In the 1920s and 1930s, National Defence had the mandate to investigate accidents. Even if your research is on a civilian aircraft, consult RG24. Your file could be located in the Central Registry (records originally stored in Ottawa) or in the regional registries (stored in the regions: Maritimes, Pacific, etc.). Library and Archives Canada’s (LAC) collection has gaps: we do not have all records pertaining to aviation accidents. Sometimes, a file simply does not exist. Some records are still at the accession stage. They have been transferred to LAC but have not yet been processed by an archivist. If the description in our database contains a note to that effect, consult the links under the heading “Accession” (see “Scope and Content” in connection with the note “Please consult the related accessions”). Each record group has its own challenges but the basic concepts explained here will help you to conduct your research effectively. There are over one million companies in Canada. They include banks, grocery stores, pharmacies and department stores and we interact with them on a daily basis. If you need information about companies’ origins or how they were organized at varying points in time, the Library and Archives Canada (LAC) collection has a number of published resources to help you find what you need. With more recent information often accessible in online directories and business resources, you may find LAC’s resources more useful for historical research. This post will focus mainly on directories, a significant source of information about companies. A company directory, whose title may change frequently in the course of its lifetime, provides factual, publicly available information that is published annually in a single resource. Directories may also differ in content and comprehensiveness. Print directories generally cover a larger time period than other formats, such as online or microform. Well-known directories include the white pages telephone companies publish. Yellow Pages can be used to locate companies by name or line of business. LAC, meanwhile, has a historical collection of telephone books on microfilm, some dating back to the 19th century. The microfilm includes an index. A printed index is also available for consultation in the reference room on the 2nd floor of our facility at 395 Wellington Street. Another important resource is the Financial Post family of directories, published by MacLean-Hunter Limited since the late 19th century. The FP Survey of Predecessor & Defunct Companies provides information on the status of companies including incorporation, bankruptcies and dissolutions, as well as dates and jurisdictions. Survey of Industrials, which has profiles of companies including financial information from manufacturing, real estate and other sectors. FP Markets, Canadian Demographics, which provides community profiles for Canada. Also part of this collection is the Financial Post, later the National Post, a major Canadian business newspaper. An index for the first half of the 20th century has been published separately. City directories include large bodies of company information and allow searches by company address, name and line of business. Names of company directors are sometimes included. Many city directories have sections dedicated to company listings and advertisements. The bibliography that follows can be used for retrospective searching. LAC has a comprehensive collection of city directories for consultation on site. Additional information on this collection can be found on the LAC website. Other helpful directory titles include the series of directories of Dun & Bradstreet of Canada, Scott’s Directories (various titles covering manufacturing, industries, etc. ), and the Canadian Trade Index. In addition, the microfiche set Annual reports and financial statements of Canadian companies includes information on both public and private companies. SEDAR (System for Electronic Document Analysis and Retrieval), a database of documents filed with the thirteen provincial and territorial securities regulatory authorities. Furthermore, provincial company registrars, whose details can be found in the Corporations database of Innovation, Science and Economic Development Canada (formerly Industry Canada) are useful for finding information on difficult-to-locate companies. Please note that many of these financial services companies have adapted their resources to the digital era and digitized copies of their print editions. Historical reports on the companies are also preserved and are available in both print and digitized formats. If you have any additional questions regarding Canadian company information, we would be happy to assist you with your research! The blog post “Ordering documents: what numbers do I need?” helps clients locate the right reference numbers among all the choices in a descriptive record. But what about the MIKAN number? What is that all about? The MIKAN number is a unique record number automatically assigned by the MIKAN system to a record at all levels of description (fonds, series, accession, file, item). Because it is a mandatory field in the MIKAN system, the number appears on each archival descriptive page – at the very bottom – in our Archives Search database. See example below. Although it can be used to locate and order material, it is not an archival reference number per se and will not show up on our examples of reference numbers page. Therefore, it is best to always include the full archival reference and not just the MIKAN number. A patent of invention application (for a patent) is a document that usually includes “an abstract, a specification, and drawings.” This type of application is important as it often becomes the official patent document once it is approved. Like the patent process itself, the structure of and type of information in each application is highly regulated. Here’s an overview of what Library and Archives Canada (LAC) holds in terms of patent applications. A subsequent blog post will detail the steps to follow when searching for a specific application. The article “How to find Orders-in-Council at Library and Archives Canada” explains how to find complete references to these Orders-in-Council (OICs). But then how do you access the OICs that interest you? You have several choices: consult the originals on site, search in the Canada Gazette, consult the OICs on microfilm, or request a reproduction. In the article “Orders-in-Council: What you can access online” we learn that Library and Archives Canada holds the Privy Council Orders-in-Council published between 1911 and November 1, 2002. However, many of them are not available online. You must therefore do your research on site to find the full references. Can’t come in person? You can send a reference request using the form Ask Us a Question, or you can hire a freelance researcher. Please note that our research services are limited. Orders-in-Council are part of the Privy Council Office fonds, series “Orders-in-Council,” sub-series “Minutes, Annexes and Reports.” The entire group is identified by the document group number RG2-A-1-a, an essential part of the reference number. It is important to first consult the annual registers and indexes, which list all the Orders-in-Council submitted by the Privy Council Office and provide details to be included in the references (including order numbers and approval dates). Most registers are bound to their respective indexes.